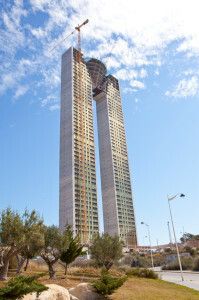 The claims came from a July 20th story in Spain’s El País newspaper about the financial troubles of the Intempo building. The article discusses the series of problems the builders have encountered during construction and towards the end reads (my free translation): “In January 2012 there was a new surprise: they had not taken into account the shaft for the elevator, as can be seen in the promotional designs which do not not show the spaces typically dedicated on the roofs to the elevator engines. ‘The space had been calculated for a block of 20 stories,’ according to the same sources”. I will admit that I have no idea what the El País article is referring to, but clearly journalists in both Spanish and English-speaking media interpreted these sentences to mean that the builders had forgotten to build elevators into the buildings. If they did, however, they had fixed this problem by April 2013, when a blogger visited the building, rode in one of the elevators and wrote about it. She describes the trip as being incredibly fast, less than one minute to go up 45 stories. According to the blogger, that’s in “slow mode”. In fast mode, it can make the ~600 feet climb in about 30 seconds. The blogger mentions that each of the two towers has 3 elevators. Four elevators make the trip to the penthouses in the middle. So in all, it has 10 elevators. You can see one of the elevators and the space for another one in her blog posting. She does say, however, that they had to take the stairs to make it to the roof. Whatever El País meant in its story, it’s certain that the rest of the media that ran with the “no elevators” story did not do the most basic fact-checking of either visiting the building, looking at the blue-prints, calling the construction company, or even googling. I found the blog posting I referred to above by searching for “ascensores intempo“. “Ascensor” is the Spanish word for “elevator”. The real question here is how much can we trust the media, when journalists seem to rush to write stories, repeating what they think they read somewhere, without doing the most minimum fact checking? To be fair, so far it does not appear that the major English language media has ran with the story, but I wonder if it’s only a matter of time. It’s troublesome enough that any journalist can be so careless to not even try to check their facts, even when we are dealing with what sounds like a very improbable mistake. 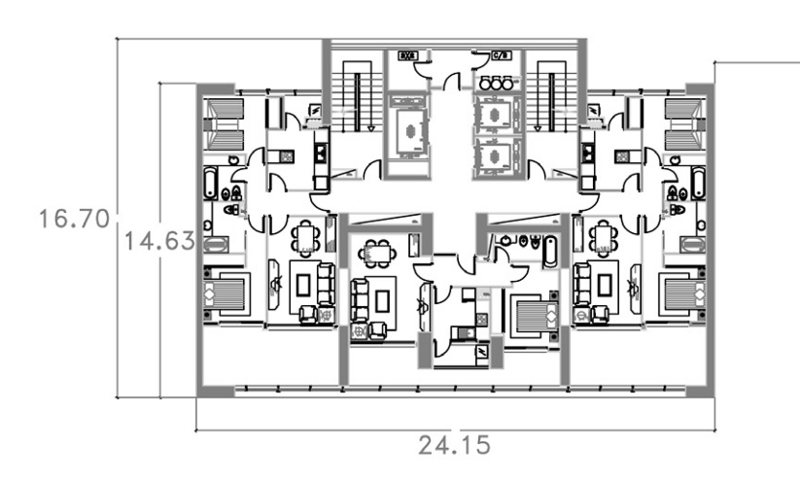 This typical floor plan for one of the towers, shows 3 elevators, in addition to stairs. Today two stories came out that highlight the stupidity of people and how quick they are to overreact to every day situations. In the first one, a man receives a kit for making a gun out of legos (to each their own) – puts it together in his office and next thing he knows has a SWAT team storming in and cuffing him against the door. A lego gun. Incredible. In the second one, a mother breastfeeding her baby at Target is told that breastfeeding in public is against the law (not true) and that she must leave Target. WTF? Target later clarified that its policy (as well as the law of several states) allows for breastfeeding at its stores – but the damage was already done, the woman already humiliated, and the baby probably disturbed. I applaud the woman for standing up for her baby’s rights, and, of course, I’m disgusted at Target – but nor surprised. This is a company which, after all, has been accused of racial discrimination and which ‘‘sourced from countries with widespread, well-documented human and labor rights abuses. '” (see The Blue Pages, 2nd Edition: A Directory of Companies Rated by Their Politics and Practices ). I’m ashamed to say that I have shopped at Target not too long ago, but I will make sure to remember these instances when I go shopping again. “The private actions of men that in no way offend the public order and morals nor harm a third party, are only reserved to God and fall outside the authority of judges”. AP reports today that some veterans of the Afghanistan and Iraq wars, including a first-term congressman, are questioning the low number of medals that have been awarded in these two wars: six. In comparison, 244 were awarded in the Vietnam war. The military argues that the current wars don’t present the same opportunities for incredible heroism, something which the veterans question. I think I’m with the military on this one. The only Congressional Medal of Honor recipient that I’ve ever met is Charles Liteky, a former Catholic priest and Army chaplain who saved over 20 wounded men during a savage battle in Vietnam by carrying them from the battlefield to a safe zone while dodging enemy fire. Read his wikipedia entry, it is incredible what this man did. I cannot imagine that valor like his is particularly common. I came across Liteky through Mike’s work with School of the Americas Watch (Mike was responsible for scanning and ocr’ing the lists of SOA graduates and their “torture” manuals’; after his work the School of the Americas started denying requests for new lists of graduates.) Liteky is (was?) fully involved in the organization, “crossing” the line in peaceful demonstrations to bring attention to the perverse work of the School of the Americas. For those unfamiliar with it, it’s the American military institution that instructs Latin American military on how to fight social movements at home. It was one of the institutions where the doctrine of national security was developed and disseminated. Many of its graduates have been accused of committing crimes against humanity. Liteky has been arrested and sent to prison several times for his peaceful protests – even as he entered his 70’s. And continues fighting the good fight. I would hope that the Medal of Honor not suffer the fate of the Presidential Medal of Freedom which is given almost exclusively for political considerations (Bush gave it to people who are likely to have committed crimes against humanity themselves). Hopefully it will continue meaning something – but as our cultures becomes a greater and greater celebrator of mediocracy, it’s unlikely that it will.